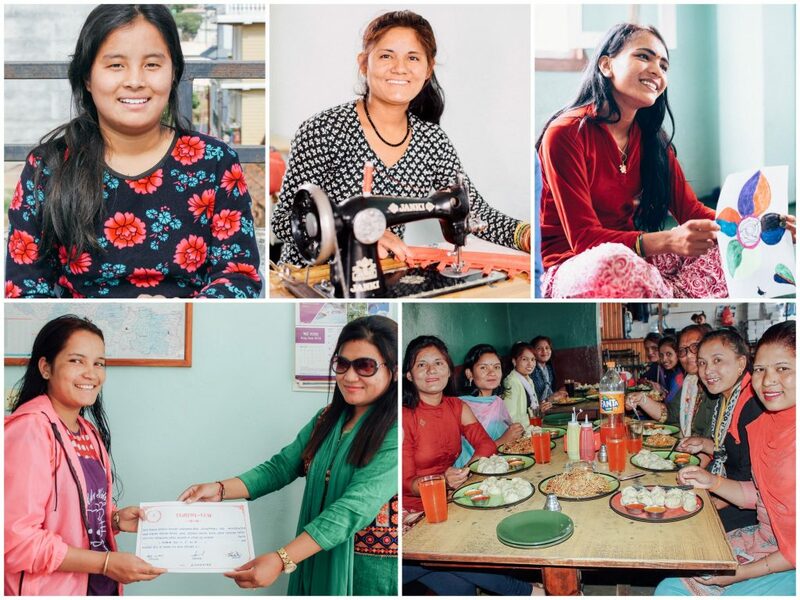 Photo: These girls are happy to have graduated from their skill development coursework in which they became proficient in many skills such as tailoring. We are happy to report that in June one of our orphans, 17-year-old Laayra*, graduated from our orphan home in Nepal with some of the highest exam scores of all 26 children in her 10th grade class. Then she was accepted to nursing school, placing 9th out of 130 applicants for the incoming class, and received a scholarship our donors provided to cover her tuition fees. Laayra’s first semester of nursing school began this month and she will study there for 3 years with the goal of obtaining her Bachelor of Nursing Science degree. We previously shared Laayra’s life story where she said, “I am trying my best to study hard and be a good leader in the future. I am in the 10th grade now and I am praying to God that I can study science in 2 years. My aim is to be a nurse. So, everything is up to God.” It is an immense blessing to see one of our orphan’s hopes and dreams fulfilled. The 3 girls now living at the rehabilitation home recently planted beans in their garden, and they are looking forward to a good harvest in December. The beans will provide a healthy staple in the meals for both our girls and the children living in our orphan home. The girls are also learning to make popular Nepali dresses and stuffed animals such as elephants, dogs, rabbits, and monkeys. Many of the girls’ crafts are sold online at SheHasHope.org, and all proceeds directly support their rehabilitation. We are now preparing to receive a new group of trafficking survivors being referred to us by various government and nonprofit agencies in Nepal. I am Sabita*. I am now 28 years old. When I was 3 years old, my father married another woman and left us. My father is out of contact since last 25 years. I am uneducated. I did not get an opportunity to go to school due to our poverty. From age of 12 years, I have been taking care of my mother by myself. My mother is sick since last many years. I have one elder brother. He is married and stays separate from my mother so he does not take care of my mother. When I was 23 years old, I was working in a small food shop in a small Nepali town. I worked there for six months. In this time, one day a woman gave me a cup of tea to drink. When I drank the tea I became unconscious, apparently, she had put some kind of drug into the tea. When I awakened I was in a Nepal/India border town. Some bus staff shouting outside the bus, ‘Bus for Delhi . . . Bus for Mumbai . . . ’ then I knew this was a strange place she brought me to. She was forcefully trying to get me down from the bus but I held onto the seat strongly. The other people saw this situation and they asked me what was the matter. I told them this woman trying to take me to Delhi. I don’t know how I reached here, that this is an unknown place for me. So they called the police. The police arrested this woman on the bus, she was working with the traffickers. It was a miracle that the drug had worn off in time for me to realize what was happening to me. Many, many others are not so lucky as I was. The police then handed me over me to a local charity working to help trafficking survivors. I stayed there for two days where they gave me a place to stay, fed me, and helped me to recover from the incident. After two days with the charity, my uncle and my brother brought me back home from there. After one month, the local charity that had helped me sent me to the She Has Hope rehabilitation home. I completed a six-month skill training course here. The director of the She Has Hope home offered me a job to help the other girls at the home. So thankfully, I have been working as an assistant here for the last four years. I am so thankful for the new opportunities She Has Hope has given me, and that I now get this chance to help encourage and support other girls the way I was.